When this recipe originally ran in The Globe and Mail, I received a lovely note from reader Barbara Zuchowicz. This dish reminded her of a wonderful meal she had in Italy: "It brought back joyful memories of a trip to Italy my late husband, an exceptional cook, and I took a number of years ago. In Bologna we stumbled across a little bistro restaurant, Columbina, totally unprepared for what we were about to experience. At first we were the only non-Italians in the restaurant. The pork and bean stew was miraculously delicious, and simple, the wine perfectly matched, the service warm, kind, and first rate. Classic Italian. We tried, several times, to reproduce the stew at home, but something was always missing (besides not being in Bologna). You nailed it yesterday: the lemon and thyme! But this was not all. Part way through our meal, a young couple was sat beside us; they were from Abbotsford, BC (!). They were on their honeymoon, had just arrived it Italy that morning, and, neither had never been out of Abbotsford before. They were in Italy because a friend, a recent graduate of an opera programme, had gotten his first job in a small opera house near Bologna. They were going to see him perform the next day. Having started our meal, we knew they were in for a big surprise. It was a magical, "Babette's Feast," moment when they took their first tastes of the simple but perfect food. Their world was opening. Your recipe made me wonder where they are now, and how their world has changed." A classic cassoulet takes a time-consuming day in the kitchen to prepare. But the final result, after hours of simmering and adding ingredients, has a taste of richness, warmth and comfort that washes over you when you eat this fine dish. 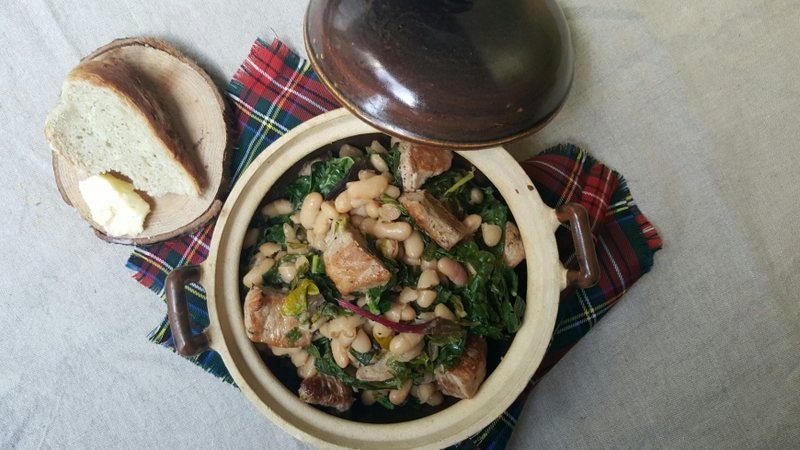 Classic pork and beans echoes cassoulet but is quicker and still provides a warm glow on a cool fall night. My take on the dish is perhaps more Italian then French in concept because it is finished with bitter greens. They liven up the dish, giving it that finishing twist that I like in food. Use kale, Swiss chard or collards – even arugula will suffice – and don’t overcook the greens. This dish is perfect for reheating (add the greens at the last minute) and it freezes well, too. There are two methods for soaking beans, the slow soak overnight in water to cover and the quick soak (my preferred method as I usually forget to do them the night before). To quick soak, cover beans with water, bring to boil on high heat, boil 2 minutes, cover and let sit for 1 hour, then drain. I like cannellini beans but you could use any beans you prefer. Don’t salt beans while cooking, it toughens them. Cover beans with water by 1 inch and soak overnight. Drain and rinse. Place in a pot and cover with 2 inches water. Add lemon slices, thyme sprigs and chili. Bring to boil then reduce heat and simmer for 30 to 40 minutes or until beans are al dente. Drain and reserve beans and water separately. Season pork with salt, pepper and chopped lemon thyme. Heat oil in large sauté pan or heavy pot over high heat and sear 1 minute per side or until browned. Remove to a plate and reserve. Reduce heat to medium and add onions. Cook for about 5 minutes or until softened. Add garlic and slivered sage and continue to cook until garlic is softened, about 1 more minute. Stir in beans and pork. Add stock to pot and return to a boil. Cover then reduce heat and simmer for 45 minutes to an hour or until beans and pork are tender. If mixture begins to dry out, add reserved bean-cooking liquid. Add kale to pan. Cover and cook for another 5 minutes or until greens are wilted. Taste for seasoning, adding salt and pepper and a spritz of lemon juice as needed.